Ernesto Grassi in his essay Rhetoric and Philosophy states that there is an aspect of speech which can be characterized as pre-rational, on which the rational statements of science and logic are based. These are the archai or ultimate principles, they are not an outcome of the syllogistic analysis central to logic; or of the propositional statements through which the sciences express themselves. The archai are characterized as indicative or allusive. Indicative speech is metaphorical, tropic, and makes connections between expression and meaning through making what is spoken about visible. Faces of Terror explores this hypothesis through the depiction of the facial expressions of people caught up in violent situations, captured at the moment of expression. The test is not the conceptual truthfulness articulated prior or posterior to the encounter with the image but the immediate semantic character of the encounter with the image, which in opposition to the rational nature of propositional representation has a pathetic essence; meaning is accessed through emotions (pathé). Artistic interest in facial expression as a guide to the emotions has a long history. Most recently it can be tied to the Academies of the 18th and 19th centuries who elevated the representation of people in conflict situations to that of the highest artistic genre, History Painting; the painting of people caught up in scenes of significant activity, which frequently meant violent struggle. A necessary outcome of this was the need to depict a variety of facial expressions in order for the painting’s narrative to be clearly understood and experienced by the viewer. One might expect a full spectrum of facial expressions to be deployed in these works, yet If one studies paintings from this tradition one sees that the facial expressions of the protagonists rarely express what we could identify as uncontrolled emotion. The dominant expression is one of stoicism in the face of danger and challenge. Even the dying do so with great equanimity self-possession and acceptance. The inner calm indicated by these facial expressions indicates emotions under the control of a rational intellect. Very rarely do any of the protagonists in a history painting show themselves controlled by emotion. An explanation for this can be found in contemporary aesthetic theory, which sought to categorise the affects that that an artwork should have on the emotions of a viewer. Gotthold Lessing writing in 1766 on the ancient Greek statue of Laocoon comments on the facial expression of Laocoon. Caught in the fatal embrace of a sea-serpent one would expect his expression to indicate him emitting a ‘shriek’ at this moment of great peril, instead one finds that the artist has transmuted this into a ‘sigh’. The reason according to Lessing is Greek artists’ overwhelming commitment to the primacy of beauty in art. Anything that disrupts the beauty of the artwork for the viewer is to be avoided; extreme grimaces and gestures of pain would do just that. In order for the beholder to get the full aesthetic return from the contemplation of the statue the protagonists in the scene must not themselves betray strong emotions, as these would disrupt the flow of aesthetic exchange between the artwork and the viewer. If the artist had created a graphic representation of pain in Laocoon’s facial expression then the emotion engendered in the beholder in Lessing’s view would have been annoyance, which would disrupt their engagement with the statue’s beauty. Instead the Greek artist deals in the evocation of emotions that are an aid to the aesthetic experience, in this case the ‘sweet feeling of compassion’ that Laocoons predicament as depicted induces in the spectator. This academic idea of beauty can be characterized as platonic, i.e. otherworldy, intellectual. If aesthetics is primarily concerned with exploring the connection between art and feelings (aisthêton = ‘that which is perceptible by sensations in the senses’) then the emotions most suitable for accompanying this platonic beauty need to be those that themselves can be inspected by the intellect for their moral worth. Thus the viewer is effectively detached from the emotion of the scene depicted in the work by the intellect. There are instances of figures in Academic history paintings showing unedifying forms of facial expression, but these usually indicate figures who are beyond hope. This can be seen in some of the plague victims in Gros’ Napoleon Visiting Plague Victims in Jaffa a figure of the damned in Delacroix’s The Barque of Dante, and also the individuals about to be executed in Goya’s Executions of May 5th. Yet there are significant examples in painting where the disruptive emotions such as uncontrolled sorrow have been used to great effect. Rogier Van Der Weyden’s Deposition (1435) utilizes an array of facial expressions signifying sorrow to create a work that has an immediate emotional contact with the viewer. These range from unrestrained hand-wringing hopelessness, deep red-eyed tear streaked sorrow to a pale-faced swoon. 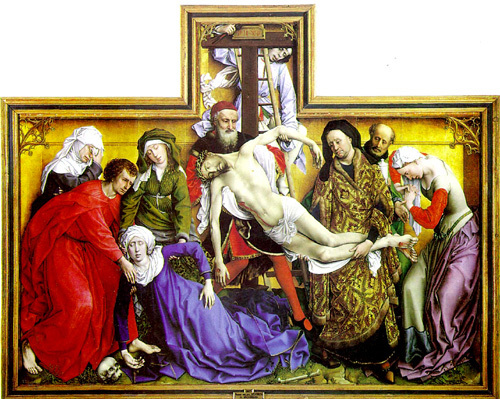 Van Der Weyden’s painting is not from the academic tradition, instead it emerges from the Flemish guild tradition of the 15th and 16th century. One thing that characterizes this work it is its adherence to what we might describe as realism. There is an insistence on an extremely clear delineation of the things and figures depicted. Each is unmistakably what it is, people are people, material is material. This visual condition of the representation allows us to witness how they are; unconsolable, tearful, overcome by the emotion of the situation.